I recently posted a 4 part tutorial on making watercolor sketchbooks from old books - recycling of orphan books to give them a new life. The tutorial is in 4 parts, in order to cover the procedure in depth. 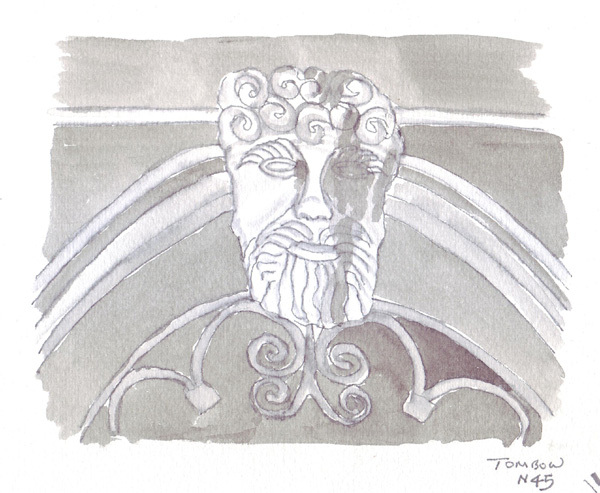 Rice Freeman-Zachery did a Q and A with me about bookbinding and making my sketchbooks, and I now realize that it would be nice to have one blog post with links to all 4 sections of the tutorial. Introduction to Tutorial: Selecting a good book to recycle. Part 1: Removing the old page block, tearing down watercolor paper and making new signatures. Part 2: Creating the new page block. Part 3: Casing in - gluing the new page block into the old book cover. There is a bookbinding category in the column on the right side of the blog page, under the Archives list. All of my watercolor sketchbooks, recycled and made with original covers (including book cloth covers I made), are tagged in that category. When I arrived, I selected six books from the Reanimation Library, and made some color copies of interesting photos and illustrations. At that moment I had no specific creative ideas, except to make another small pamphlet book. 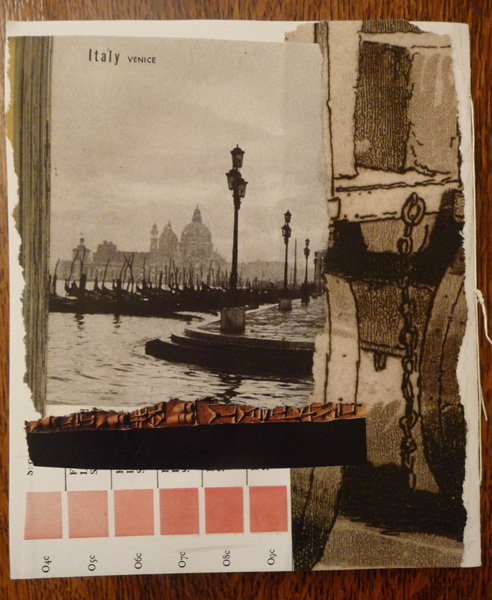 While I was looking at my copies, a paper mask ink drawing from Joseph Leeming's book, Fun With Paper, made me think of Venice - and I was inspired to make a book using colors and images that remind me of our visits. The books I pulled, making an average of 3 copies per book, were: Hornung's Handbook of Designs and Devices, Talk With Your Hands, Interior Design, Stage Make-up, The Printed Picture, and Fun With Paper. The images that I used from last time were from the book The Story of Writing. It amazes me that such random and quickly chosen illustrations/photos can inspire creative ideas on such a different topic. I had enough random images to use when I combined these copies and I happily tore paper and glued it in place for the next two hours. 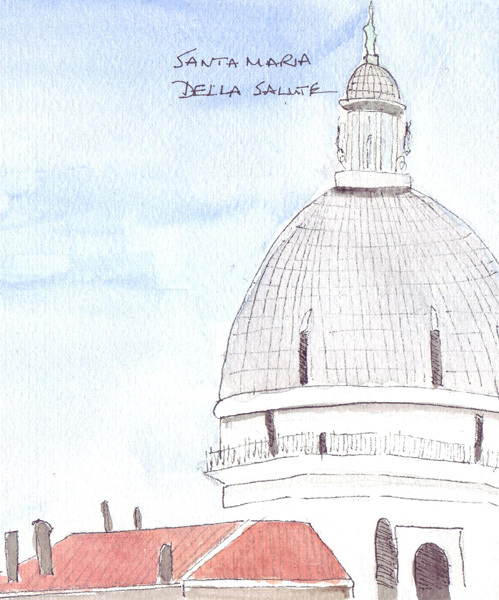 The only new image I copied while working was the photo of Venice on the last page and that came from a book entitled Around the World in 2,000 Pictures. 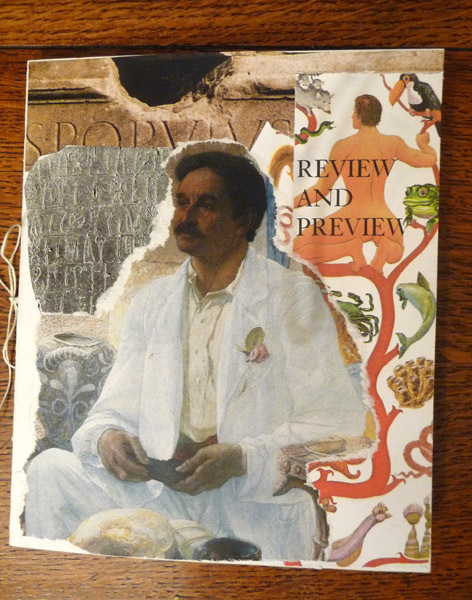 I used ink, stamps and watercolor pencils over the images after everything was glued in place and stitched the two folios together using linen thread and a pamphlet stitch. 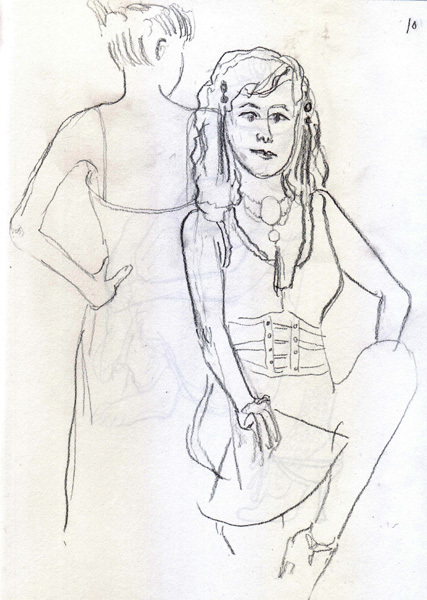 Thursday night Live Figure Drawing at the Society of Illustrators is always a surprise. The models are given a theme and they bring costumes to wear. Last night it was Carnivale in Venice. How appropriate is that? However, I found drawing really difficult. 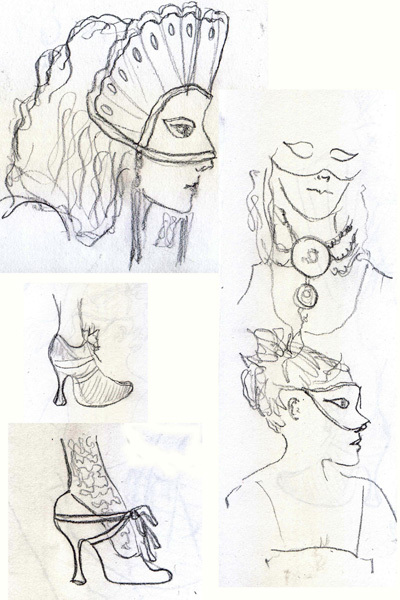 When faced with masks, I couldn't figure out where to start. Here is a page of quick sketches that I did during the 2 minute poses, a 10 minute pose, and a 20 minute pose. On an unrelated topic, my daughter is starting her own business as she prepares to send her third child off to kindergarten in the Fall. She worked for American Express after she finished Business School and was at Ground Zero on 9/11. It was then that she and her husband decided to start their family and she now has 3 wonderful children (who you have seen over the years on this blog). Please take a look at her new website. 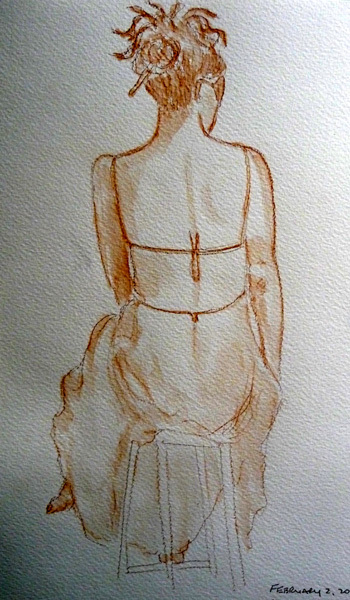 She is just beginning, but soon will have more about the projects that she is doing - both with clothing and home decor. http://www.rachelrodin.com/ Click on her logo for information. And thanks. She will be thrilled if she gets some traffic. 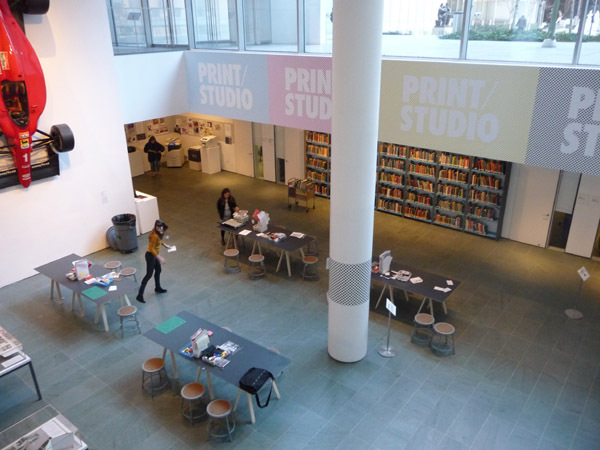 The Museum of Modern Art, in conjunction with two upcoming exhibits (Print/Out and Printin'), set up a Print Studio in the Education Building. 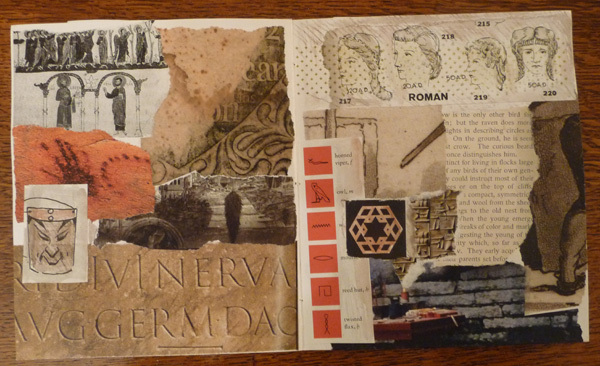 I spent the afternoon there yesterday and made a small collage book. 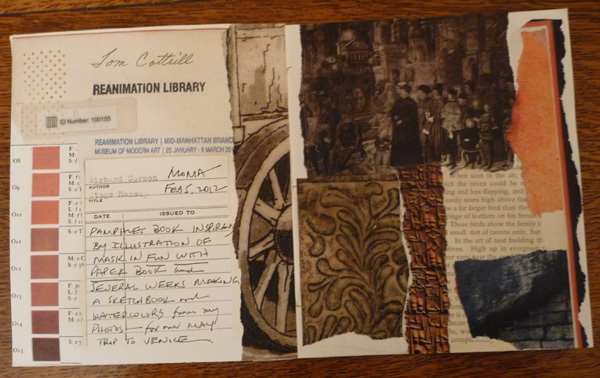 The "heart of the Print Studio" is a collection of books known as the Reanimation Library. 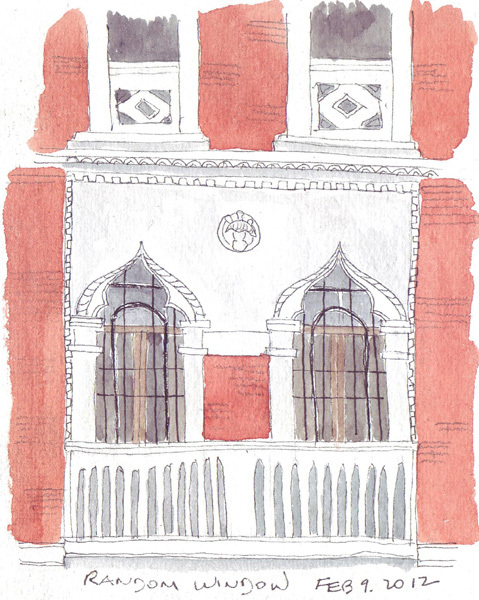 It is fascinating and well worth reading about the development of the collection and its permanent home in Brooklyn. It was developed as a resource for all artists, regardless of their medium. When I arrived, I met my friend Judy and had a little tour of the Print Studio. Here is an overhead photo of the space, with the Reanimation Library on the back wall, copiers, scanners, and computers in the back corner, and work tables for visitors supplied with a variety of art tools and paper. I don't have much experience with collage and wanted to make one during the afternoon. One of the staff said, "Why don't you make a book? We haven't had anyone do that yet." I browsed books on the shelves and pulled 6 that had interesting illustrations and photos, and was immediately drawn to one called The Story of Writing. 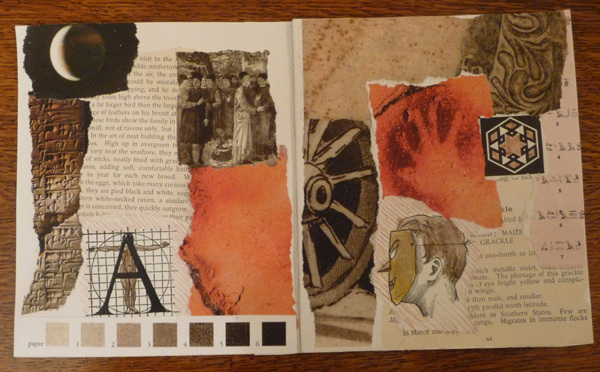 I love text mixed with images and made some copies of great alphabets from the book. I then made a few copies from a Science text called Pathways in Science: The Next Generation and settled down to "play." 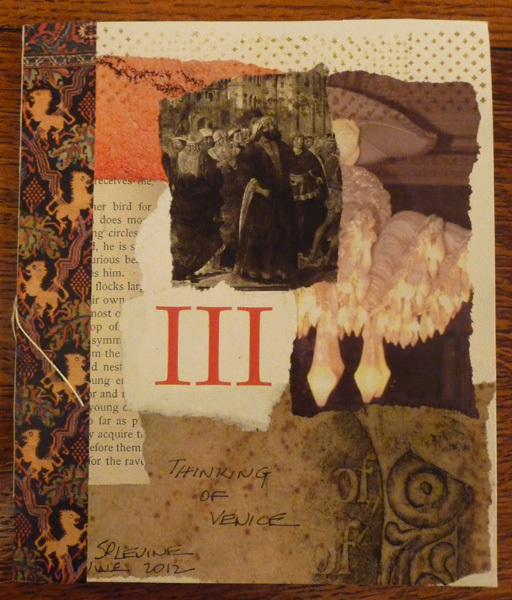 I folded 2 folios and added images that appealed to me for the front cover. I really intended to make this a book about text and writing. Pages 2 and 3 were from the frontpiece of the science book - a wonderful bookplate for assigning the book to students and the title page with the stamp for the Reanimation Library on the title page. 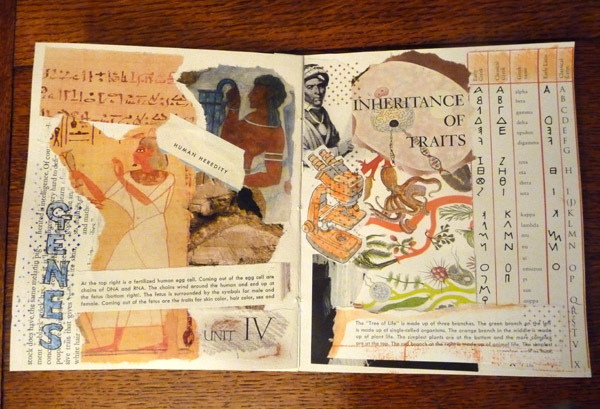 I was still interested in pursuing the theme of language and writing - and the next thing I knew, I was making a book about human reproduction and the inheritence of genetic traits. I was very much in the zone and channeling in a unique way. Fascinating what our brains do if left to wander! 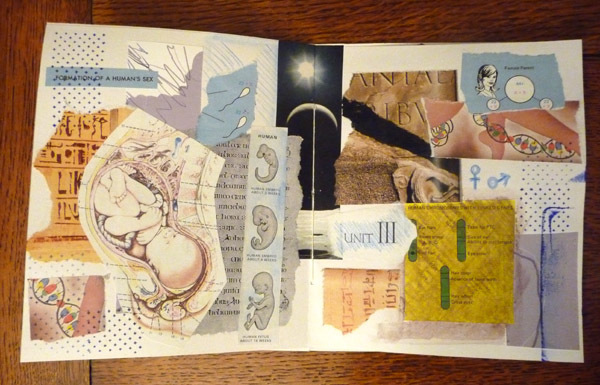 At the very end of my "art play," I opened the 3rd book I brought from the shelves, The Atlas of Human Anatomy, and copied a pregnant uterus for one final collage. 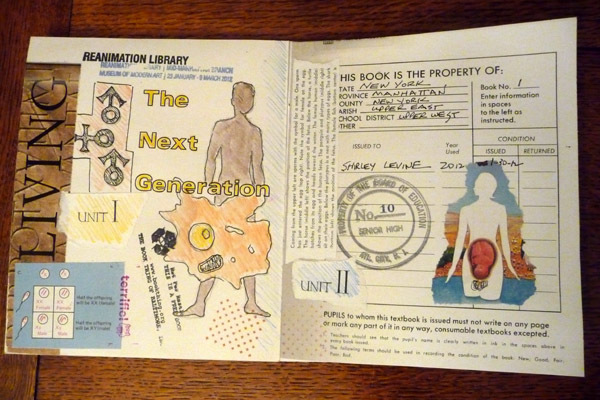 At the end I sketched a human figure and cell, some genetic symbols, and added watercolor pencil and stamps. 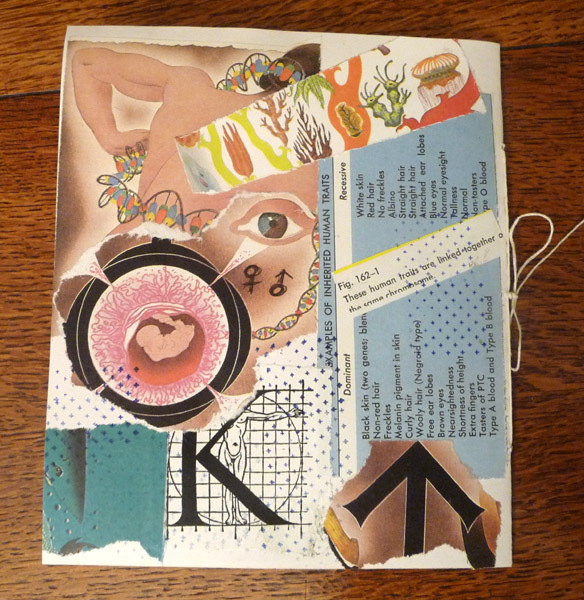 Here are the pages of my finished pamphlet stitched booklet.